My husband and I received this toaster as a wedding gift almost 3 years ago. We liked the features such as the bagel, frozen and cancel feature. My husband and I freeze our bagels so this feature came in handy. Toasting Evenness This toaster toasted the toaster alright. If you toasted more than two slices of bread, you had to turn down the heat, or the bread would get a little darker than what we liked. Safety The safety of this toaster was alright while it lasted. Sadly, my husband accidentally cut the cord of this toaster with a knife. Thankfully the kitchen has a serge protection so my husband wasn't killed or harmed. The only thing harmed was the toaster, which obviously had the be thrown away and the knife was left with a burn mark in it. Be careful not have your cord close to where you are cutting. :) Ease of Cleaning I would say this is an average ease of cleaning for a toaster. It has a little tray on the bottom to collect the bread crumbs which was very helpful. Durability It worked well while it lasted. Design The design of the toaster is good. You could tell this toaster was made better than most of the toasters you typically find in the store. We love this toaster. It does a great job every time. In our household, this two-slice toaster is all we need. I like that it evenly distributes the heat. Every time. When you adjust the temperature on the heating element, it does adjust accordingly. When you make more than two pieces, the second round of toasting is also consistent. You can trust that this will produce the toasty good results that you set it for which is handy when you have picky kids! Toasting Evenness The bread is evenly toasted. Each piece is evenly toasted. Round two or round three is not more done than expected. Safety I love that this unit cools down pretty fast. This is especially handy when it has to go back in a cupboard pronto. I do not want to let this sit out all the time so when we are done using it, I want it off the counter! It's also great because I do not worry about my kiddos burning themselves in the rush of meal preparation. Design Just what we need-nothing more and nothing less! Before my kids were born and it was just my fiancé and I, we figured we didn't need to have a giant toaster. The black and decker two slice toaster was a little pricey for the size, but small enough to have some counter space. 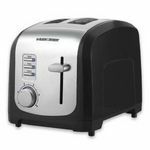 When I was first starting to use it, I noticed it had six browning features which I thought was nice for a small toaster. That's where I ran into my first problem. I was making breakfast and had it set for the medium setting, and it seemed to heat extremely fast and burnt my bagel. Thinking maybe I just didn't do it right and turned it too high, I put it on the low setting, but it came out hot and not toasted. Then my husband tried using toast because he thought maybe the bagel was too big and pushing against the metal inside the toaster, but he had the same results. Not to mention, it made a giant mess of crumbs. It does come with a crumb catching plate under the toaster that is supposed to be removable, but I almost broke it trying to take it out and had little burnt pieces of bread all over my counter. It also claimed to have a frozen setting feature for waffles and other frozen items. It was no better than the toaster itself. Everything that was even closed tasted freezer burnt. I ended up returning it for a much better reliable brand. The only thing I can say that was good was no problem getting my refund back. I think they knew how upset about it I was. Would definitely not recommend. 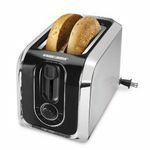 The black and decker two slice toaster is a great first toaster to own. I bought mine a while ago to keep in my guest house and it works great! I like that even though this toaster is only two slice it has a lot of great features. I also like that the toaster slots are nice and wide making it easy to toast begals and English muffins. I like that the settings are so accurate. I have never had burnt toast from this particular toaster. I also like that it was very affordable. I know this would be great for a first time home owner that needs a toaster. Toasting Evenness The toasting evenness is great! I never have burnt spots. Safety I am not aware of any safety features on this toaster. Ease of Cleaning This toaster is a little difficult to clean. Durability My toaster has lasted for a while now and seems durable. I have even dropped it once by accident and it still worked. Design The design is small but looks great on the countertop. I also love the stainless steel design. It has lasted, but I am just not very satisfied with it's performance. Toasting Evenness It does toast your bread pretty evenly and that is a plus. What I really do not like is the fact that after you toast the first slices of bread, it tends to get a little hot. Then, when you try toasting more bread, it seems to toast it way too much. So, if you plan on toasting several slices, I suggest that you let it cool down a bit before you try toasting more bread. It used to leave my bread overly toasted and it would frustrate me so much. Safety I t is very kid friendly and it does not stay hot to the touch after you toast your bread Ease of Cleaning That is what I disliked the most. It gets stained really easy and it always seemed to look like it was stained. Durability I have had it for a couple years and it is still doing it's job, so it is pretty durable. it has even fallen a couple times and it is still looking pretty new. Design It is a little bulkier than I would prefer, but overall, it is pretty sturdy. Toasting a great little toaster! I really wanted a modern, sleek-chrome toaster, but was in between homes when mine died. So, I purchased what I thought was an in-between toaster--inexpensive and not quite as pretty. What I ended up with was one that not only toasts well, but keeps on going. I love the wide toast openings, as my husband toasts his bagels. There's even a bagel setting--very cool. For me, the reheat option is great, as I tend to get caught up doing something while my toast cools. Toasting Evenness For the most part, breads and English muffins toast evenly. However, if the bagel is large, the top may not toast. It's not much of big deal though. I just stop it half way into the toasting session and turn it around. This is only an issue with large bagels. I suppose large pieces of bread would have the same issue. No big deal, though. Safety I don't see where there would be an issue unless a young child was to put something metal into the slots. That would be an issue with any toaster though. Ease of Cleaning There is a removable crumb tray which makes it easy to clean the crumbs from the toaster. The outside is easy to wipe clean with a clean cloth lightly dampened with water. Durability I've been using this most everyday for several years and it just keeps going. Design Although I really wanted an expensive chrome toaster, I'm very happy with the design and look of this toaster. We have had this toaster for a little over three years. We use it several times a week, mostly for breakfast foods. My toddler loves toaster waffles for breakfast, so we get a lot of use out of it with just those! There are a few things that I really like about this toaster. One thing that I really like is the retractable cord. We keep the toaster out on our counter, but it's nice that the cord gets tucked away and out of the way when we are not using it. The other thing that I really like about it is that the tray clicks in and out on the bottom. So when there are lots of crumbs, it's an easy job to pop the tray out and throw them away. I think this is a very durable small appliance. We use it a lot in our family and have not had any problems with it. I hope this one lasts many more years, however I would probably look for another toaster of the same brand because I am so happy with it. The only thing that you might not like is that it only has two slots. If you have a bigger family, you may want a four slot one. Overall I really like my toaster and it's something that's worth the money because it lasts a long time. Toasting Evenness Gives a pretty even toast. Safety It's never randomly started smoking or anything like that. Ease of Cleaning I just wipe it off and shake it out. 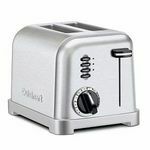 Durability okay so for me the average toaster's life span in my home is about a little under one year so I'm use to doing things like jiggling the cord or hitting the knob to get the thing working. This toaster however I don't even have to do all that and I have had mine for about two or three years. Even now it works like new and I never have any problems with getting it to work. Design I like the design because it's slick with a futuristic type of feel added on to the initial classic design. The different setting that let you switch in between bagels and frozen really come in handy (I tend to freeze my bread and bagels to keep them fresh). Another feature that I just love is the "cancel" button that lets you stop the toasting process at anytime. Best toaster I've ever had. This is the best toaster I have ever had. 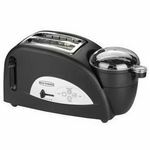 You can use it for toast, sandwich bread and waffles. And you can choose the heat level. It is awesome! I've even put some frozen things in it and it still worked like a charm. If you're looking for a toaster, don't hesitate to purchase this one. I think it is the best value for your money. I have been using this toaster for a little over a year now and am satisfied with it, it was a fair price and makes a great piece of toast. The only thing I am uncomfortable with is putting Pop Tarts in this toaster as they tend to get "bendy" after they get hot and the gaps that hold the products in the toaster have sucked in a Pop Tart or two over the year. Toasting Evenness I love the dial that allows me to decided how "toasted" I want my bread. On my old toaster I was constantly popping up and down hoping I could get my toast just right, now with this toaster I know everytime I pop it down it will come up looking exactly how I want it. Safety The plastic dial on the toaster is heat sensitive, it seems to have gotten a melt indent on it while using the electric skillet on the counter close by the toaster. Ease of Cleaning It's easy to clean, it wipes down super easy and doesn't look smudged up or fingerprinted between cleanings either. Design I love the modern design without looking to fancy, it matches everything.